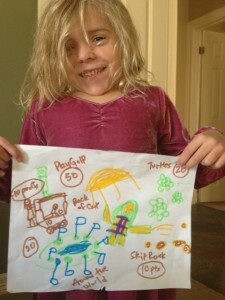 This past week, I asked her to create her own golf course adventure… this is what she created below. To give the adventure some “color”… we added a point value to completion of each task and created a goal of getting 50 points. Our adventure lasted around 60 minutes.. and everyone left with a smile. As the child gets older… continue with the “Adventure”, just change the task to be in alignment with where they are in the learning to playing spectrum. This strategy has been extremely successful for me with my girls. As a parent it accomplishes a couple of things: i) Gives us goals or a road-map, ii) Creates a “game within the game”… to ensure we have a good time and reward ourselves and iii) Provides an incentive to reward the completion of our task/adventure. So next time you take your child to the course… ask them to create their own golfing adventure… assign a point value for each activity and plan for a special reward at the end of the day. If you do this, I will promise you a good day!